Celebrate summer fun and Father’s Day weekend at the 2016 San Diego International Boat Show where more than 200 boats from entry-level family cruisers and trailer boats, to sailboats and luxury superyachts will be on display. 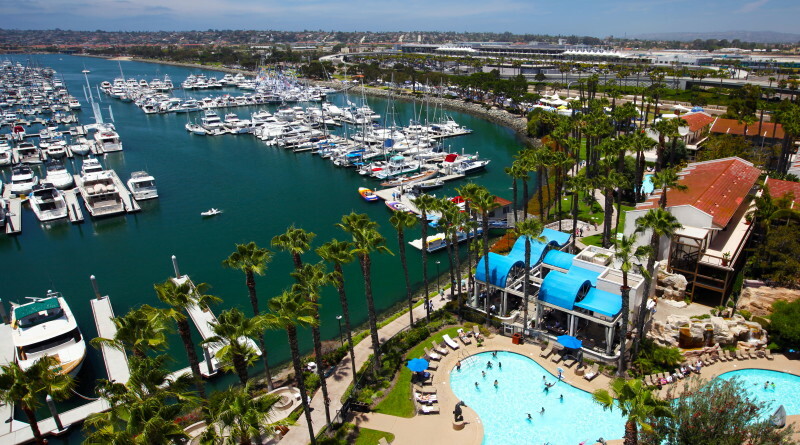 SAN DIEGO — Celebrate summer fun and Father’s Day weekend at the 2016 San Diego International Boat Show where more than 200 boats from entry-level family cruisers and trailer boats, to sailboats and luxury superyachts will be on display. The 13th annual San Diego International Boat Show cruises into Spanish Landing Park East on Harbor Island June 16-19 for four days of fun. At the 2016 event, sponsored by the Port of San Diego, seasoned sailors, world-class cruisers and those new to the boating scene will have an all-access pass to discover the boating lifestyle and a chance to shop the newest boats and marine accessories. As the region’s premier summer boating event, the boat show’s in-water display area will increase by 120 feet bringing in 50 more boats and providing more than 200 vessels, docked in the marina and parked on land for visitors to browse, board and buy. Several vessels will also be making their West Coast debuts at the 2016 San Diego International Boat Show. This elegant offshore cruiser will make its West Coast debut at the show and is a must see for guests. Designed to fit the way you live, she offers a spacious living cockpit, an innovative aft terrace and ergonomic details throughout. Every detail and function has been considered to enhance life aboard and the overall cruising experience.Armchair seating with integrated cup holders, a sun bed and the longest cockpit in her class are some of the amenities on deck. Inside a walk-in shower, large, double wardrobe and a forward-facing chart table can be found in the Owner’s Cabin, while the VIP Cabin provides guests with a spacious suite complete with a private en-suite washroom. Multiple sail plans means the yacht can be adapted to every sailing preference and cruising location. Stop by the Cruising Yachts display for a closer look at this elegant cruiser. 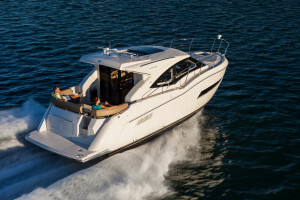 MarineMax will be bringing the sporty Galeon 445 HTS to wow boat-show guests with the vessel’s beautiful design of the third generation Galeon yachts. Once aboard, guests will enter a world of unprecedented luxury and innovation. Bright airy spaces lit by ample skylights and large windows await passengers. The wide glass sunroof and retractable aft exterior glass bulkhead open to allow sunshine and breezes to flow through the helm and salon, which seamlessly blends into the cockpit. 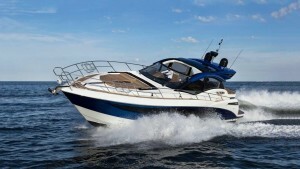 However, the main focus of the Galeon 445 HTS is on high-performance. Galeon designs, conceived by top naval architects such as the UK’s Tony Castro, assure unparalleled modern styling and convenience. Their ability to hand-tailor your boat – down to the rivets – combined with leading technology and design makes every Galeon yacht exceptional. The Carver C37 Coupe will be on display for guests who want to learn how to “live the cruising life with flair.” With her sleek lines and flawless profile, the C37 Coupe provides an unmatched level of comfort. The two-deck yacht includes a thoughtfully designed galley, an airy salon filled with natural light, two spacious staterooms with amenities and abundant seating with 6-feet, 5-inches of headroom. Once you open the salon’s dual doors, the helm, salon and galley become part of one single-level outdoor/indoor living space perfect for entertaining guests, relaxing or simply enjoying life on the water. However, the C37 Coupe is more than a cruising yacht, she’s also a performer. 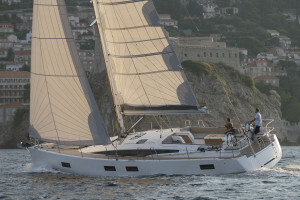 The C37 Coupe will be at the Denison Yachts display. Make sure to stop by the JK3 Nautical Enterprises display where the new Moody 54 will be on exhibit. The Nordhavn 59 Coastal Pilot and Nordhavn 68 will be at the Pacific Asian Enterprises booth, and The Catamaran Company will be bringing the Gemini Cat 35 for guests to admire. Another must see is the 65-foot yacht, Sam’s Place, owned by comedian Jerry Lewis, which will be at the Fraser Yachts display. The Art Brooks Sea Company will have a Johnson 65 and Mikelson Yachts will have the Mikelson 43 and 50 on exhibit. The Maritimo 50 and Hampton 650 will be at the show with Hampton Yachts, along with the Fountaine Pajot Mahe 36 catamaran presented by West Coast Multihulls. Silver Seas Yachts is bringing its 41 Cantius Cruiser and Mathiesen Marine will feature Raymarina, Lowrance, B&G and Garmin at the show. Visitors of all ages will get the chance to get their feet wet with a variety of activities including standup paddleboarding (SUP) and kayaking. Try it Cove is the place to have fun on the water as a sampling of inflatable boards, hard boards, kayaks and other paddle sport watercraft will be available for boarding. Boaters can sharpen their skills at workshops and seminars presented by experts, educators, and adventurers. Free daily seminars will cover a range of topics to help you make the most of your time on the water. Seminars include, “Traveling to Mexico by Private Boat,” “Catamaran Cruising” and “Visit Catalina.” Visit sandiegointernationalboatshow.com for more information. This year’s show class schedule includes 60-minute sailing seminars with SailTime San Diego, where guests can learn the basics of sailing aboard the Beneteau First 22. Students will spend 30 minutes in the seminar tent learning the fundamentals and then head out on the water to gain some practical, hands-on experience. Instructors will demonstrate tacking, gybing, point of sail, Rules of the Road, sail trim, and control, man overboard recovery and more. Visit sailtime.com/sandiego to register. Cost is $65 per person and includes admission to the boat show. Youngsters will also have some fun at the show’s Kids Zone where little skippers can have their face painted, make nautical arts and crafts and more. A variety of good eats from the area’s most popular food trucks, a floating Tiki Bar, Anchors & Ales Beer Garden and live entertainment will make the boat show an ideal place to shop, tour, learn, and relax with friends and family. The San Diego International Boat Show is produced by the Duncan McIntosh Co., publisher of Sea Magazine, Boating World, The Log Newspaper, FishRap, Editor & Publisher, and OC Weekly, and producer of the Fred Hall Shows, the Los Angeles Boat Show, the Newport Boat Show and the Central Valley Boat & RV Sportsmen Show. Show hours are noon-7 p.m. Thursday and Friday, 10 a.m.-7 p.m. Saturday, 10 a.m.-6 p.m. Sunday. Admission is $15 (credit cards accepted) for adults and free for children 12 years and younger. Active military personnel, free. The San Diego International Boat Show is located at 3900 N. Harbor Drive, San Diego. For more information, call 858-794-6974 or visit sandiegointernationalboatshow.com. The 2016 San Diego International Boat Show, the region’s premier summer boating event, provides guests an all-access pass to discover the boating lifestyle and a chance to shop the newest boats and marine accessories. More than 200 vessels will be on display. * Thursday, June 16: Noon-7 p.m.
* Friday, June 17: Noon-7 p.m.
* Saturday, June 18: 10 a.m.-7 p.m.
* Sunday, June 19: 10 a.m.-6 p.m.
Motoryachts, trailer boats, sailboats, entry-level family cruisers, sportboats and luxury superyachts. Seminars, workshops, demonstrations and the latest in marine accessories. $15 for adults; free for children 12 and younger. Active military personnel, free. Major credit cards accepted. Take the 405 Freeway to the 5 Freeway South, take the Interstate 8 exit toward El Centro and exit Rosecrans Street and merge onto Camino del Rio W. Make a left onto Nimitz Blvd., and a left on Harbor Drive. Parking is located at the corner of Harbor Drive and Harbor Island Drive. For additional details, call 858-794-6974 – or visit the show website: sandiegointernationalboatshow.com.